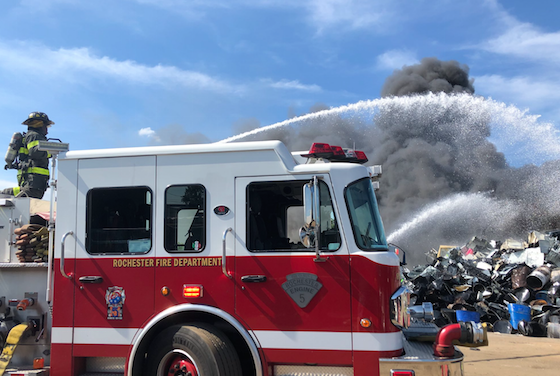 Firefighters work to put out a blaze at a scrap yard in Rochester, NY. A crushed fuel pump led to a fire at a scrap yard located off Lyell Avenue in Rochester, NY, last Friday. The fire was at Genesee Scrap and Tin Baling Company on Steel Street. Firefighters said the blaze was located under several stripped vehicles, officials said. Firefighters said those vehicles had to be moved in order to fight the fire. On top of the fire, ambient temperatures were in the 90’s with high humidity. Access and water supply was gained, but the fire was several rows deep. A second-alarm was summoned quickly and Lyell Avenue was closed down. Heavy equipment was brought in to get to the heart of the fire, which was a fuel pump that was crushed and ignited by vapors. The nearby Rochester Airport Fire Department was also called to the scene and several departments filled in.